As businesses of all sizes gain the ability to monitor competitor prices, Amazon has found it more difficult than ever to undercut the retail world. Using the right tools, any company can pull up a particular product and monitor competitor prices for that item. If a price changes from one day to the next, a retailer can respond by lowering its own prices. As a result, Amazon has lost its foothold as the lowest-priced resource for a wide variety of items. Unfortunately, this doesn’t bode well for Amazon’s customer satisfaction rankings. While the company still ranks high in the Internet Retailer Top 500 Guide customer satisfaction survey, it lost points this year, dropping to 83 after holding an 88 score in 2011, 2012, and 2013. This dramatic drop coincides with Amazon’s decreasing presence as the most competitively priced retailer. This change has industry insiders wondering if Amazon has decided to stop taking a loss in order to aggressively undercut the competition on pricing. For a while, many believed Amazon might win the war, as it seemed to be losing its pricing advantage. But recent pricing data from Kantar Retail shows that Walmart has now taken the lead in pricing. As Walmart launches local delivery in the coming months, it may gain even more of an edge over the competition. But with Amazon’s recent rollout of local delivery in Manhattan, perhaps the e-tailer plans to take on brick-and-mortar businesses in a way that goes beyond pricing. With customer service satisfaction levels decreasing, Amazon has reason to be concerned. Are customers sincerely unhappy with the retailer or are they simply expressing disapproval over the increase in prices? In addition to focusing on convenience and pricing, both Amazon and Walmart have to maintain a dedication to keeping customer satisfaction scores high in order to remain competitive. Until now, it seemed like Amazon was the 1,000 lb gorilla that no retailer had a chance of beating. With consistently low prices directly and from their marketplace, Amazon was the clear leader in online retail, leaving its competitors far behind in the dust. Now, as retailers have finally found their footing, they are making a comeback and realizing that even Amazon is ripe for some healthy competition. What does that mean for you? Amazon is a formidable opponent, but it’s not insurmountable. 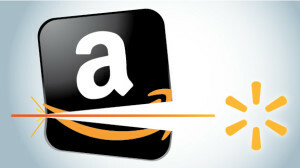 With the right price tracking tools, you stand a fighting chance against Amazon.